When you find a great shoe, you just want to shout about it from the rooftops. Consider this the rooftop, because we’re totally obsessed with Ja-Vie ballet flats. As most expecting and new moms can attest to, comfort is key. But that doesn’t mean your pre-baby style has to be distant memory. Thanks to this new line of comfy ballet flats, you can put your best foot (er, feet) forward. Ja-Vie flats come in a variety of fun colors and patterns, so you can slip them on with any outfit. The extra supportive insole makes them feel more like slippers than shoes, but with plenty of support for a day out on the town with your tot or a waddling, pregnant walk to work. 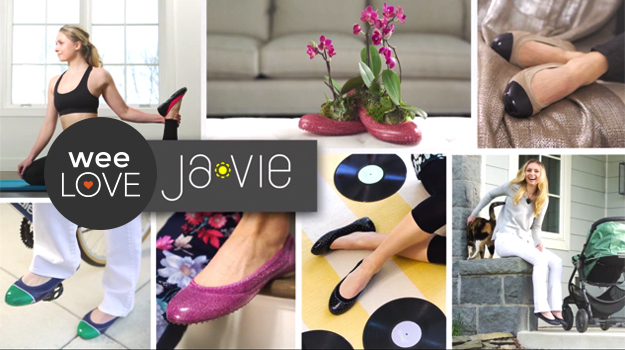 (Ja-Vie was actually created by a husband and wife team, inspired by the search for stylish comfy shoes after having their first baby.) The best part? No breaking them in. The soft, knit lining with lightweight jelly outsoles becomes an instant perfect fit. Go ahead, take your new mom uniform to another level. Your tootsies will thank you. Next story weeLove: Hit the Brakes! Previous story weeLove: Gas be Gone!